Here is the Event Calendar for the 2018-19 Season along with details about the events. We hope you'll make plans to join us. Your participation in these events raises funds for our non-profit Foundation. Town of Conway residents and non-resident taxpayers FREE passes are now available. An processing fee of $15 will be charged for new passes and $5 for renewals. Trail Days - Volunteer for the day for a Free Annual Membership! To sign up, please email Cort Hansen or call him during business hours at 603-356-3042. Cort has requested that anyone interested in volunteering 7 - 8 hours of work in exchange for a season pass contact him directly so that he can discuss what needs to be done and what equipment may be needed. Plan to bring lunch and water, warm clothes, work gloves, and be prepared for a day in the woods. Work will begin at 8 am and continue until about 4:30 each day. The numbers of volunteers will be limited, so this is a first come/first serve basis. We thank everyone interested in helping with seasonal preparations. 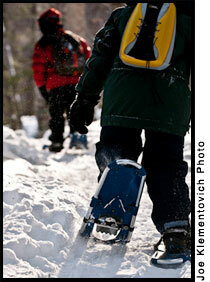 Join us any Saturday afternoon at 1:00 pm for a guided snowshoe walk along the East Branch and Saco rivers. This is a great way to try this winter activity which is gaining in popularity with each season. Snowshoes are available for rent at the Touring Center. The tour will last between 1.5 - 2 hours covering a distance of less than 2 miles at an easy pace suitable for all ages and abilities. Call the Touring Center at 603-356-9920 for reservations and plan to meet there soon after 12:30 pm. Kennett High School (SAU 9) Nordic Ski Team will host a number of race events on the designated race course in Whitaker Woods. These are exciting events to watch. There will be a number of locations along the course for spectators and a number of groomed trails still open for skiing and snowshoeing during these events. Be sure to check our snowreport for event dates and times. This event will be held in Whitaker Woods with a start at 10:00 am sharp. Check-in time for this 4 mile snowshoe race will be from 8:30 - 9:30 am. For more information about the race, and how you can become a participant vist our Snowshoe Scramble page. Snowshoe racing is one of the fastest growing winter sports in the northeast thanks to our fantastic snow and incredible trail networks. This exciting, fast-growing activity will make you fitter and faster than you ever thought possible. Come join us as a participant, or a spectator, at this scenic intown location at the northern edge of North Conway Village.